School of Fish: Another gift! I have been trying to make a habit of thanking God even when I am struggling with adjusting to everything, but He has made it pretty easy for me by showing us his provision so clearly and in so many ways! When we arrived 2 1/2 weeks ago, we intended to purchase a carseat for Zeke in Kampala. 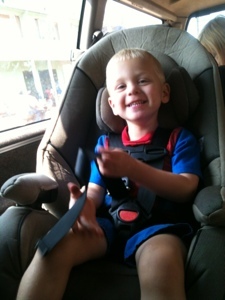 Carseats are not mandated by law, but we thought it would be wise for safety. There was already a booster seat that we intended to use for Ezra. As we went to the store we realized that the selection was very limited and would cost over $200 for the cheapest one. So our team leader, Mark, recommended that we ask the Jinja missionary community if anyone had one available. I was invited to join the Jinja missionary Facebook group and posted the need. Apparently, a family who was here in Jinja left one behind in case another family would need it. This morning we got this carseat which was as good as new and better than the ones available in Kampala. I feel much better about our commute with our younger two both in more secure seats. And it is nice and comfortable for Zeke! It is so great to realize that God graciously put it on the mind of another family several months ago in order to provide this seat for us today! Thank you, God.